1.Position 2 oven racks to upper and lower positions; preheat oven to 400°. Line rimmed baking pan with parchment paper. In medium bowl, toss beets, 1 tablespoon oil, 1/2 teaspoon salt and 1/8 teaspoon pepper. Place beets on prepared pan; roast on lower rack 30 minutes. 2.In small bowl, whisk mayonnaise, horseradish, 1/2 teaspoon lemon juice, and remaining 1/2 teaspoon salt and 1/4 teaspoon pepper; cover and refrigerate. 3.On cookie sheet, brush 1-1/2 teaspoons oil in 6 x 8-inch rectangle; evenly spread hash browns over rectangle and drizzle with remaining 1-1/2 teaspoons oil. Roast on upper rack 15 minutes or until potatoes are lightly browned and beets are easily pierced with a knife. Remove hash browns and beets from oven; let beets cool. 4.Position oven rack to middle position; preheat broiler to high. Spray second rimmed baking pan with nonstick cooking spray; place cod on prepared pan. 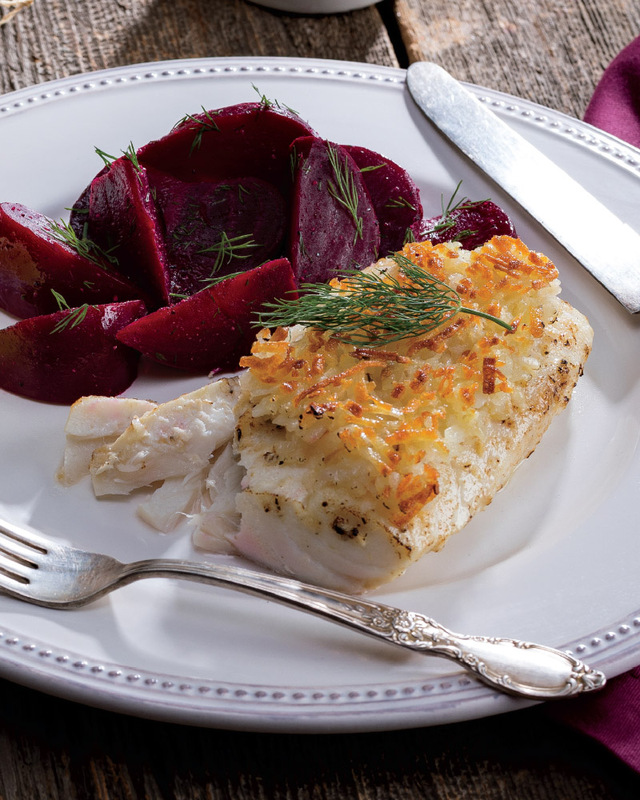 Evenly brush cod with horseradish mixture. With spatula, separate hash browns into 4 (3 x 4-inch) rectangles; place rectangles browned side up on cod. Broil 5 minutes or until internal temperature of cod reaches 145°. 5.Peel beets and cut into wedges. In medium bowl, toss beets with dill and remaining 1 teaspoon lemon juice. > Pick fresh beets that feel firm in your hand, not soft or squishy. Leftover roasted beets can be kept in the refrigerator and used for up to one week!